Roger Quested — the man behind the eponymous company — has been designing professional monitoring speakers for a very large part of his professional life, following an early career as a tape‑op at the sadly now closed Olympic Studios, and a stint as both engineer and studio manager at Morgan Studios (latterly the Power Plant and then Battery Studios). It was while Roger was at Morgan Studios that he designed his first monitors, using Tannoy drive units, but his interest in monitoring continued after he took over the management of DJM Studios in the early '80s, developing a three‑way, soft‑dome monitoring system. 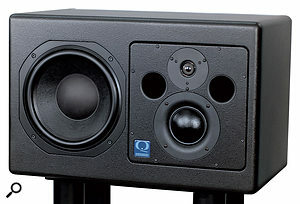 This became the prototype for the highly regarded and long‑serving Quested Q215 main monitor — the unique naming convention indicating a product with two 15‑inch bass drivers, in case you were wondering! As the requests for the Q215 system started to increase — along with an alternative compact version, the Q212 — Roger decided to devote all his time to designing and building monitors, and launched Quested Monitoring Systems in 1985. Almost 20 years later, QMS was acquired by power-amplifier specialists MC2 and the design and production of Quested speakers was relocated in 2003 to MC2's premises near Honiton in East Devon, with Roger becoming a shareholder in the company and continuing as the designer. MC2 is a specialist audio amplifier company which has been in business for about 16 years, and was set up by Ian McCarthy and Terry Clark (better known as the co‑founder and technical director of Klark Teknik). However, when MC2 and XTA Electronics merged in 2007, to form the SoundMix group, the resources available to the Quested side of the company were reduced, and so late last year Roger and his marketing director Guy Lewis bought out the QMS business, to re‑establish it as a fully independent company — although a very close working relationship has been maintained with MC2. The current Quested product line‑up is surprisingly expansive. There are currently six nearfield models, four midfield monitors (including the subject of this review), and four main monitor systems, plus three 'mix & match subwoofers. Quested also make a lot of customised versions of their existing designs — often to replace ageing soffit‑mounted systems from other manufacturers, for example — as well as entirely bespoke custom‑designed one‑offs (or should that be two‑offs for stereo and five‑offs for surround...?). As the name suggests, the new V3110 monitor is a three‑way system in Quested's 'V‑series' and it is based around a single 250mm (10‑inch) Volt bass driver, custom‑designed specifically for this monitor. The bass-reflex MDF cabinet measures a chunky 380 x 600 x 360 mm, and the whole system, including the integral amp chassis, weighs 39kg. The 75mm soft‑dome mid-range unit is supplied by Vifa, while the 28mm soft‑dome tweeter is from Morel — and both are mounted in a rotatable sub‑baffle panel, along with two large‑diameter ports. This arrangement makes it very easy to reconfigure the monitor for horizontal mounting while maintaining the correct vertical alignment of mid and HF drivers. This is important, as it preserves stereo imaging and avoids the comb‑filtering problems that would otherwise afflict a monitor with horizontally disposed drivers. The blue‑painted amplifier chassis, integrated neatly into the rear of the cabinet, occupies the full width and almost the full height of the available panel space, and contains three separate amplifiers. An OEM (Original Equipment Manufacturer) Class‑D module rated for 500W (RMS continuous) powers the bass driver, while two discrete Class‑AB amplifiers (designed and manufactured by MC2 Audio) service the mid-range and tweeter with 250W (RMS continuous) each. Hum and noise is quoted as ‑100dB below the amplifier clipping point, at which the speaker will be producing 120dB (C-weighted) SPL at one metre! The overall frequency response is specified as 34Hz to 20kHz (±2dB). A front‑panel LED lights blue when the speaker is powered and working normally (it flashes blue during the power‑up cycle), but flicks red if any of the three amps approaches clipping. Serious faults or overheating result in a permanent red light and the system shuts down until the problem is resolved. The smooth rear panel acts as the heat‑sink for the internal amplifiers and does become warm to the touch, but not particularly hot even after an extended period of use. The audio input is accepted on an electronically balanced 'combi' XLR (which accepts XLR or quarter‑inch TRS jack connectors), with a recessed 10‑position switch to set the sensitivity. The working range spans +4 to ‑14dBu in 2dB steps, to generate 100dB SPL at one metre. Three further switches adjust the frequency contouring, with separate tweeter and mid-range level trims each providing zero or ±1dB boost or cut across their respective spectral ranges. The third control adjusts the bass driver's response, accommodating soffit mounting with the zero setting, while free-standing use on stands well away from walls would require a setting of +3dB. The option of +4dB is intended for really absorbent rooms and so that users don't think that they are on the end stop and in danger of running out of headroom, while the ‑6dB setting is for use with subwoofers. The rear panel includes clearly labelled controls for HF and MF contour, LF compensation and input level, as well as a 'combi' socket for the analogue audio input. 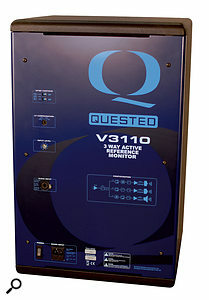 I auditioned the V3110 system at Quested's own listening space in the factory, using a familiar speech track as well as a wide range of music, including some orchestral material, simply recorded acoustic instruments and a few fantastically over‑the top film soundtracks such as Hans Zimmer's and James Newton Howard's Black Knight Batman soundtrack. Auditioning was performed with the units mounted horizontally on Quested's own substantial stands and well away from room boundaries, at the +3dB bass setting. A massive QSB115 subwoofer was introduced to the system towards the end of the tests and the response switched to ‑6dB to provide more headroom and appropriate crossover matching to the subwoofer. 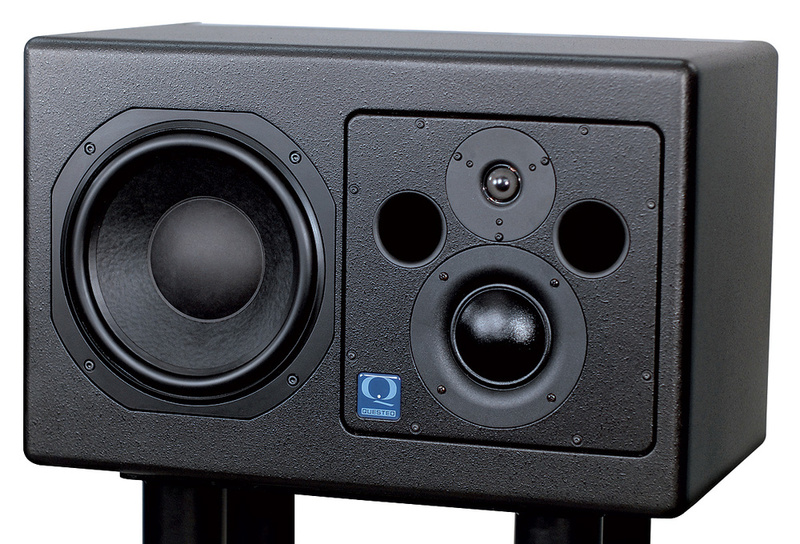 Quested's monitors are typically voiced in what many would call the 'British sound' — the top end is not over‑hyped, harsh or brittle at all, yet is still very detailed, clear and airy. In a straight A/B comparison with some other popular monitors, this spectral balance may be perceived initially as having less clarity or transparency. However, in practice, everything is still there but you don't get fatigued during long mixing sessions — which is a good thing, in my book. With simply recorded acoustic instruments, the openness of the top end and the transient detail is definitely clear and present and conveys all the required information. The mid-range is very neutral and transparent too, showing excellent resolution on spoken-word recordings, while the bass end is very powerful and very clean, with low levels of harmonic distortion at sensible listening volumes. Stereo imaging was precise and detailed in the left‑right dimension during the tests, although the sense of depth wasn't as strong as I expected. I suspect this to be more of an issue with the unfamiliar listening room and the way the monitors were set up, though, as the same mid-range unit is employed in my beloved PMC IB1s, and they certainly reproduce depth very convincingly when set up carefully. Quested has always designed his speakers to meet the expectations — and cope with the abuse — of real recording-studio applications. As a result, the V3110s are seriously robust and conservatively rated speakers, capable of astonishing volumes for such modestly sized cabinets, with no hint of dynamic compression or amplifier strain even when the red overload lights start flickering! At that kind of level, though, the speakers will serve as a very credible hairdryer, such is the strength of the blasts of air from the front baffle ports during bass transients! However, unlike some reflex speakers I could name (but won't), I could not hear any obvious 'port chuffing' noises even under these extreme conditions, presumably thanks to the use of the two large-diameter ports with flared ends, both internally and externally. The custom Volt bass driver remains clean even at very elevated levels, so harmonic distortion doesn't cloud the mid‑range at all, ensuring that the speakers remain accurate and informative, without any hint of an aggressive or tiring quality. Conversely, at very low listening levels the balance does become noticeably thinner and bass-light, but this is an inherent characteristic of bass-reflex cabinet designs and is unlikely to be an issue in normal use. I was very impressed with the performance of the V3110s, their clarity and transparency, their neutral tonality, and their real‑world robustness. This is a solid, well-engineered design free of gimmicks and shiny trinkets, but with a long-established pedigree using proven components and design strategies. Despite its modest size, the V3110 really would work as a main monitor in small and medium sized control rooms, and has the resolution and transparency necessary for both tracking and mixing work. Highly recommended. The Quested V3110 is currently priced in the UK to sit slightly above the Dynaudio Air 20, but below the ATC SCM50A SL, Barefoot Micromain MM27, K+H O410 and Genelec 1037C — or, indeed, the passive PMC IB1 and Bryston powerpac amps — and it certainly stands comparison with all of those alternatives. Detailed, precise and neutral sound character with a traditional 'British' voicing. Capable of a surprisingly powerful output with no indication of dynamic compression or harshness. Simple but effective contour EQ controls. Depth portrayal was slightly disappointing in the review setup. This active, three‑way midfield or main monitor uses proven components in a traditional design approach from a long established and well‑regarded British monitor manufacturer. Highly recommended. V3110 speakers, £5270; STV2 stands (12kg each, for vertical V3110), £611; STV3 stands (20kg each, for horizontal V3110), £763. All prices per pair including VAT. V3110 speakers $9000; STV2 stands (12kg each, for vertical V3110) $1150; STV3 stands $1300 (20kg each, for horizontal V3110). All prices per pair.